As I have promised in the previous article on moving averages, we will have a look at the potential of another trend indicator: Bollinger Bands. Bollinger Bands indicator allows us to visualize market volatility and the price level over a certain period of time. How can Bollinger Bands help us? How are Bollinger Bands made? The middle band of the Bollinger Bands is made by moving average (with the period 20) and the upper and lower bands are indicating the volatility of the market. What to look after in Bollinger Bands? Calculate carefully how many penetrations of the BB indicator are successful. Totally there are 5 of them. There are 3 losses, I have an exclamation mark over two of them, because those are completely illogical inputs – there is an uptrend which is reflected from the trend line and lasts for more than a week. At the top you can see a resistance around 29, I have marked it with horizontal line and later, at the same place around 10. Sep, there was a trend turn, including a break through Bollinger Bands. What about to add RSI or MACD indicator? I have marked two bull divergences in both indicators, which happened simultaneously with the breakdown of the lower Bollinger Band, thus the probability of the long position is increasing. Traders who trade Bollinger bands are mainly focused on such situations, where the market penetrates the outer (upper or lower) band and at the same time the price is at an interesting level (support / resistance, round price), or another oscillator confirms the validity of the entry to increase the probability of success. Lots of traders build very similar Bollinger Bands strategies. Bollinger bands (BB) are ideal for trending markets. Unlike other indicators, BB changes its shape based on the period of price (as well as the moving averages do) and the upper and lower bands perfectly measure market dynamics and volatility. 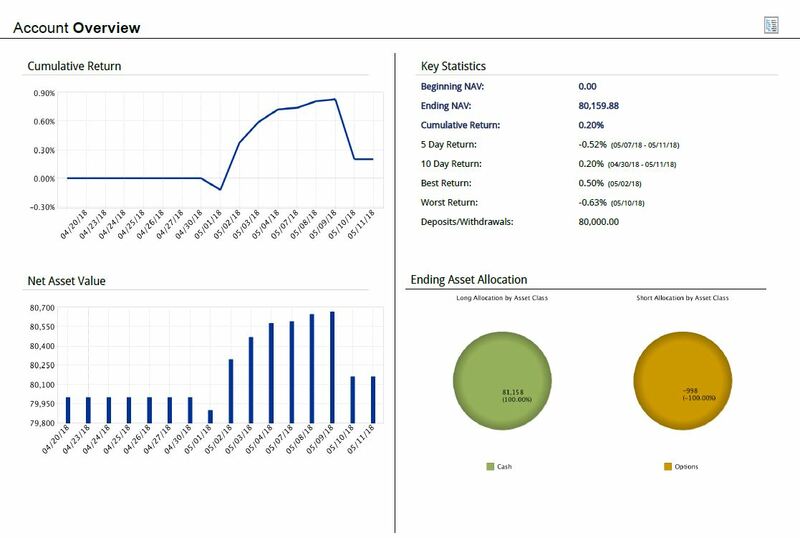 Thanks to this we can obtain many important information about the market situation. During a strong trend, the price (candle) is close to the outer band – during the uptrend it remains substantially above the middle band (moving average) and vice versa during the downtrend. Crossing of the moving average (midline) often signals trend stopping. However, in the previous article on moving averages, we have also explained that the moving averages also often act as support or resistance. It is therefore also necessary to take into account other factors when trading with BB. The narrowing of the bands often implies bigger movement. 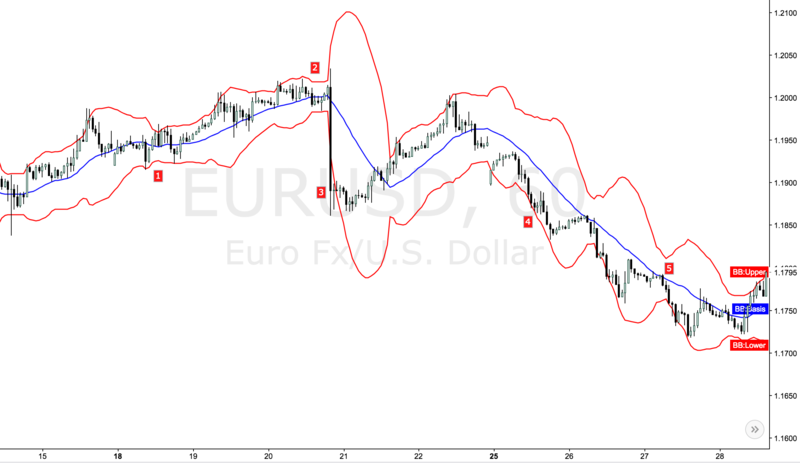 It is not possible to trade the indicator automatically and enter the trade as soon as the external band is penetrated. Price levels, supports and resistances, downtrend or uptrend must be taken into consideration. Always try to combine the indicator with price action or other indicators to confirm the validity of the entering to the position. This is not a holy grail. However, if you use it together with other techniques (indicators, price action), you can achieve a truly above-average probability of successful trades. The price has touched the lower outer band, but continued in the uptrend. Very common situation. Almost until the point 2, the price has been moving above the middle line – moving average. Narrowing of the Bollinger band and the market is moving in the chop – to the side. Then a rapid movement (most often because of fundamental news). See mainly upper and lower bands in a given period, a large expansion indicates high volatility. Unfortunately, the price did not even get down, but it rose for few more days to 1.2000. The price has moved in the lower band below the moving average, indicating a strong downtrend. The middle line(moving average) plays the role of resistance: it did not let the price go above and the market continued in the downtrend. The indicator can give us a lot of information about the state of the market. 1) For less false signals and possible trend turns, we recommend changing the basic setting of the indicator and set the standard deviation to 2.5 instead of 2. This reduces the number of false penetrations of the outer band, leaving only those that are caused by extreme volatility, which is much more likely to change the direction of the trend. 2) Add RSI indicator and follow the divergence, i.e. different behavior of the price in the market and RSI curve. 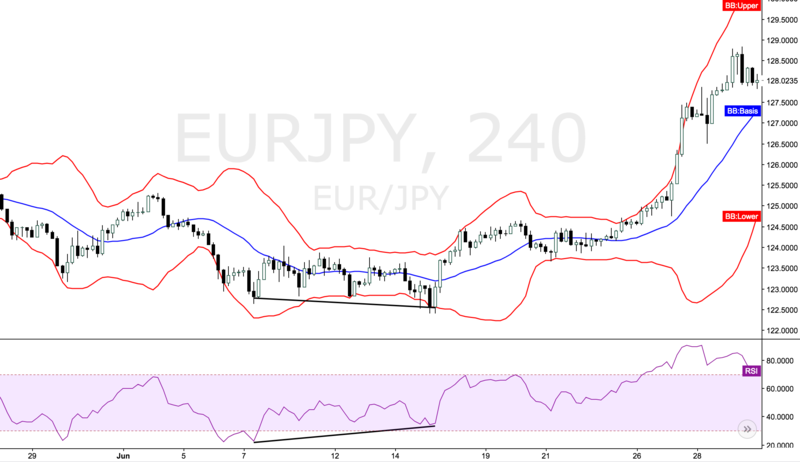 Note how the price drops slowly in the chart until the lower Bollinger Band (volatile tip) is penetrated, and meanwhile, the RSI indicator shows the bull divergence (About this in the next article). Combine the indicator with the oscillators, that help in searching for the market entry.